1 hot cup of coffee, reg or decaf, doesn't matter! whip cream in an aerasol can, aka Fluff! 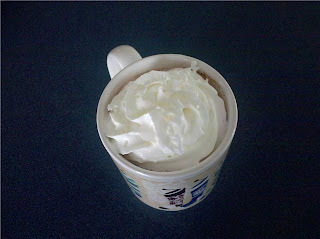 Stir hot chocolate mix and french vanilla creamer into hot cup of coffee. Shake whip cream can, dispense Fluff in circular fashion on top of drink. Drizzle chocolate syrup over Fluff. Sip & Savor!